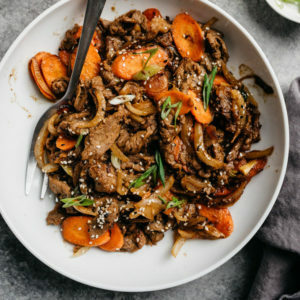 Healthy Whole30 Bulgogi is a Friday night game-changer! There are zero reasons to reach for the take-out menu when you can make this sweet and sour Korean classic at home in under 30 minutes. 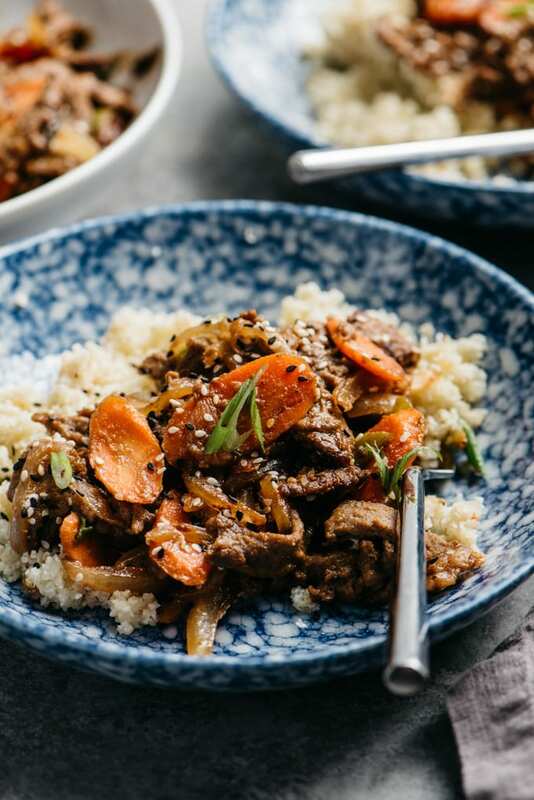 With tender shreds of beef, caramelized vegetables, and a marinade/stir fry sauce that will blow your mind, this easy and authentic dish is instantly addictive. Do you love Korean food, but feel like it’s kind of intimidating to make at home? Do you want nutritious meals that are incredibly flavorful and ready in under 30 minutes? Do you need a foolproof Whole30 dinner recipe that will easily help you crush the second half of your round? Did you answer “YES!” (or even “sure” or “yep”) to any one of these questions? Awesome. 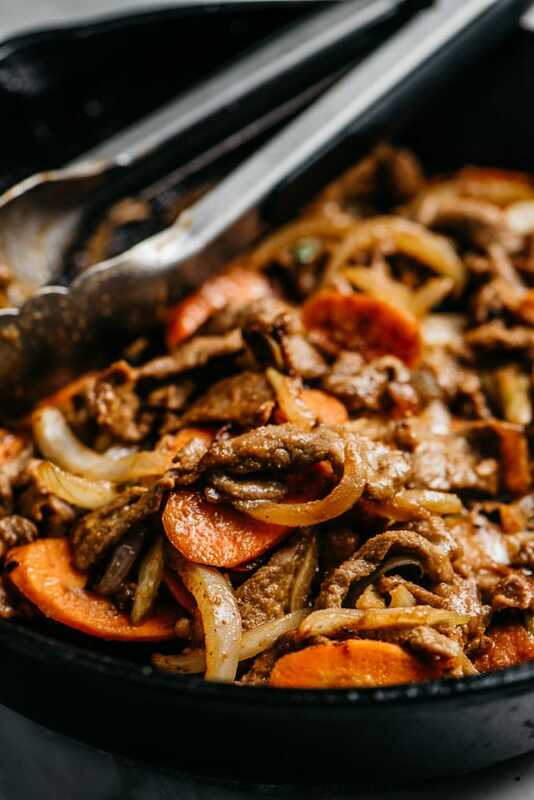 I did too, so this recipe for healthy Whole30 Bulgogi is for you and for me, and we’re going to be insanely happy eaters together. 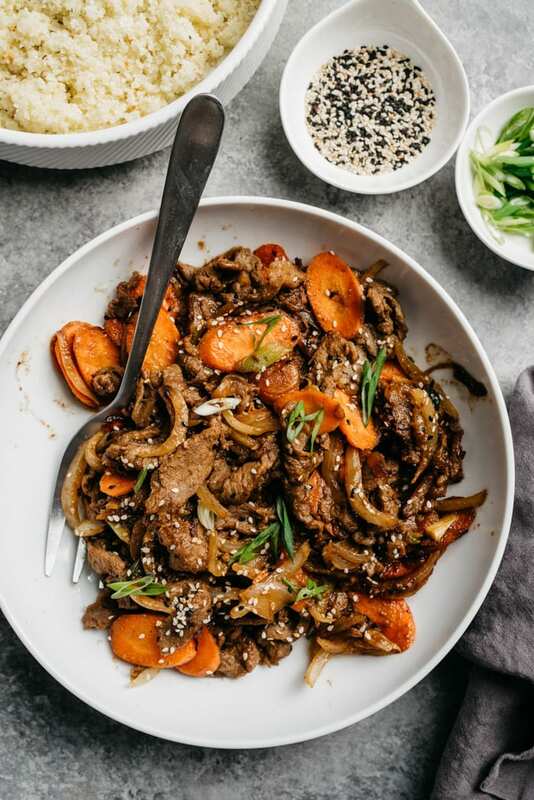 Bulgogi is sweet and sour Korean beef BBQ, and it’s one of the most popular traditional Korean recipes (for really freakin’ good reason). 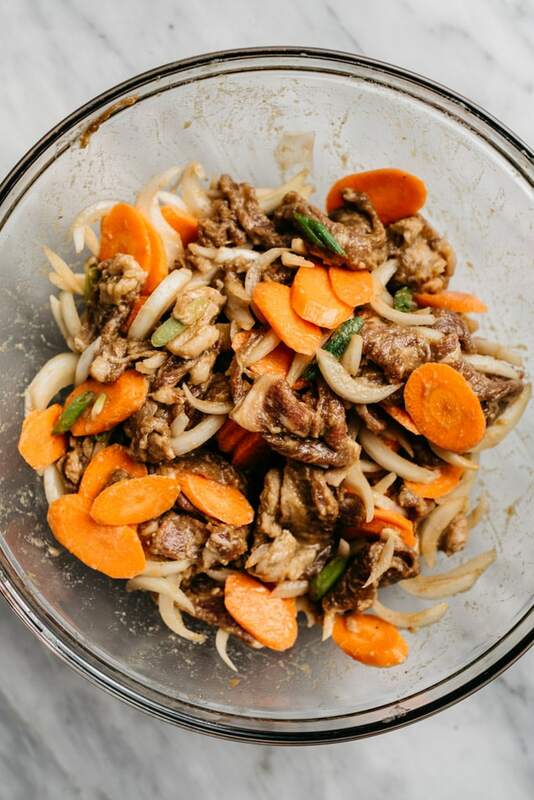 Paper thin slices of beef get tossed in a tangy, pear-sweetened marinade, then stir-fried with carrots and onions until crispy. It’s juicy and tender and instantly addictive. Cameron and I had it over cauliflower rice for “fake-out Friday” while the kids noshed on pizza and honestly? I didn’t miss pizza night one bit. Of course I totes did not develop this recipe – authentic Asian cuisine is most definitely not in my wheelhouse. 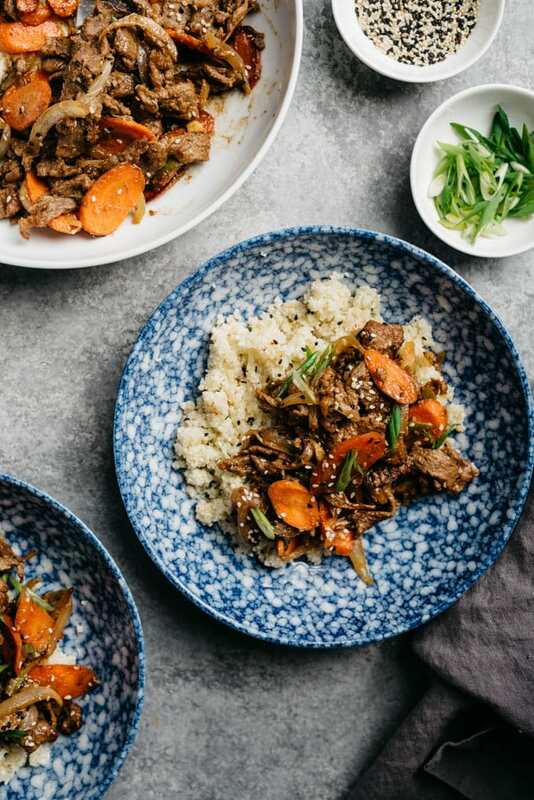 This bulgogi recipe is fresh from the pages of the new cookbook Korean Paleo by the uber-talented Jean Choi of What Great Grandma Ate. I’ve been following Jean for a long time, and have spent many hours drooling over her creations. Jean’s blog isn’t limited to Korean cuisine (there’s literally something for everyone), but I was thrilled when she launched Korean Paleo. Cameron and I are big fans of most Asian cuisine, so finding a trusted resource for authentic Korean recipes that are also gluten free, grain free, and soy free was a game changer for our weekly meal planning. 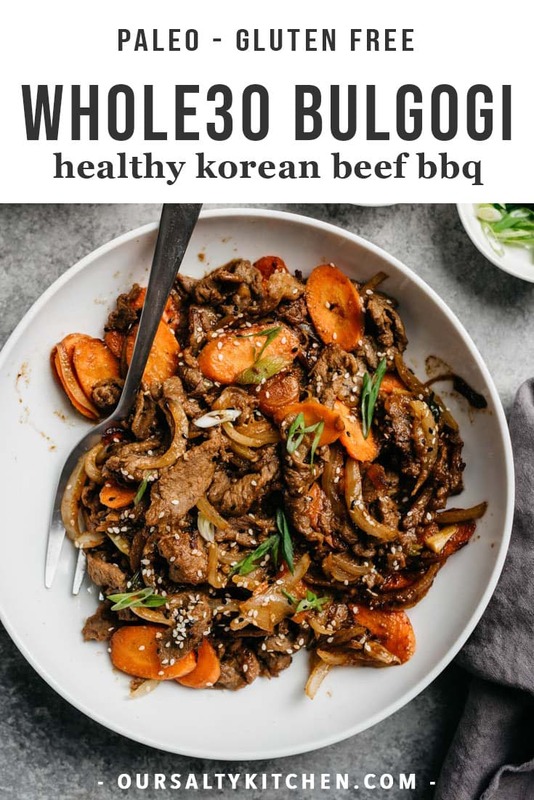 Korean Paleo contains over 80 recipes covering everything from bap (rice, or cauliflower rice) dishes, to savory pancakes, Korean BBQ, soup and stews, fusion recipes, and so much more. She details how to stock up your Korean kitchen, and where you can make reasonable substitutions if you have trouble sourcing ingredients. I add just a few cookbooks to my collection each year, and they typically fall into one of two classes: (1) “instructional” cookbooks that help me hone my overall culinary skills; or (2) specialty cuisines that I could never figure out how to prepare on my own. 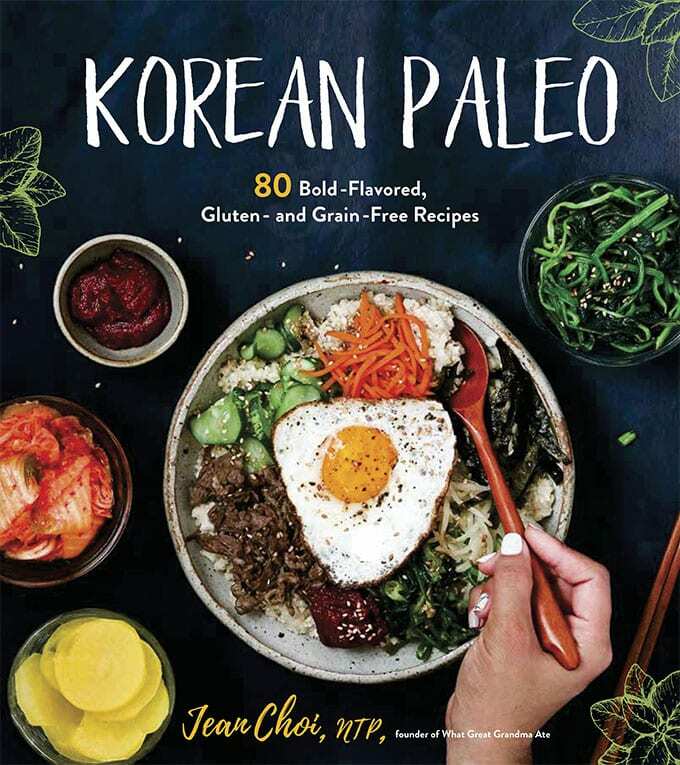 Korean Paleo fills a void in my collection, and I can’t wait to dive into more of Jean’s recipes. Bulgogi is a traditional Korean recipe made by marinating paper thin slices of beef in sweet-and-sour marinade. It’s then tossed with carrots and onions and stir-fried over high heat until crispy and caramelized. This healthy Whole30 version is an incredibly easy recipe packed with bold authentic taste that’s ready in under 30 minutes. Perfect for a stress-free weeknight dinner or fake-out Friday! 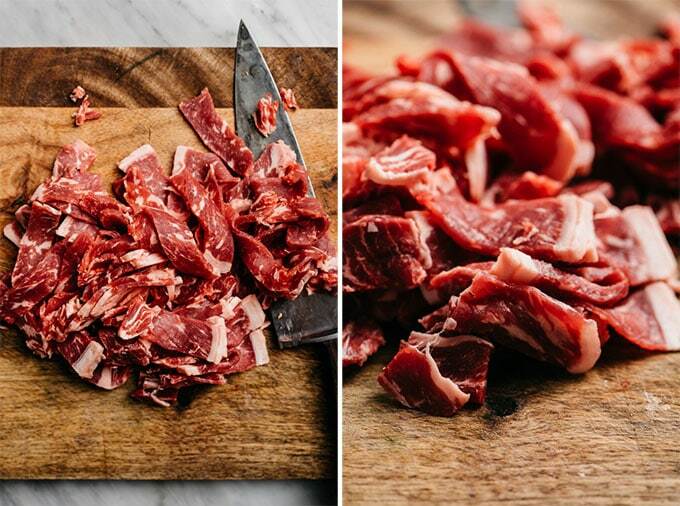 Start by slicing a pound of sirloin into super, super thin slivers. Jean suggests freezing the steak for about 30 minutes prior to slicing, and hello genius. Her tip worked perfectly! 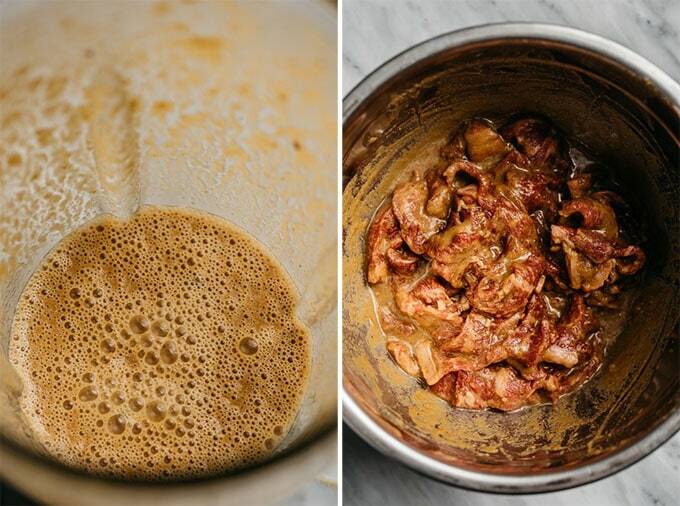 Then prepare the marinade in a blender. Combine half a diced asian pear with coconut aminos, sesame oil, fresh ginger, garlic, cider vinegar, and salt n’pepper. Whizz it up until it’s super smooth and liquified. Pour, toss, marinate. So easy. This entire process took me 10 minutes max in the morning. I popped the beef into the freezer as soon as I woke up (left a post-it note on my phone to remind me to do so!) and by the time the kids were fed and the coffee was brewed, it was ready to be sliced. Tuck the beef into the fridge to marinate for at least an hour, and up to overnight. When you’re ready to eat, slice up a regular onion and a carrot, and chop some green onions. Toss those with the marinated beef. Heat a cast iron skillet over high heat and add a bit of avocado or olive oil. Add a batch of the beef and veggie combo to the pan, enough to form a single layer across the pan. It’s really important not to overcrowd the pan (you want the beef to crisp, not steam, for best texture) so you must cook this in batches. I was able to do this in 2 batches in my 10″ cast iron. Sautee, tossing every couple minutes, until the beef is browned and cooked through and the veggies are slightly caramelized. See the crispy bits? It’s done. Transfer the first batch to a bowl, and repeat with the remaining stir fry. Sprinkle the finished dish with sesame seeds and dive in. We served this over pan seared cauliflower rice and it was heavenly. You can also serve it in lettuce wraps with dipping sauce. Jean’s dipping sauce isn’t Whole30, so I skipped it – for now. 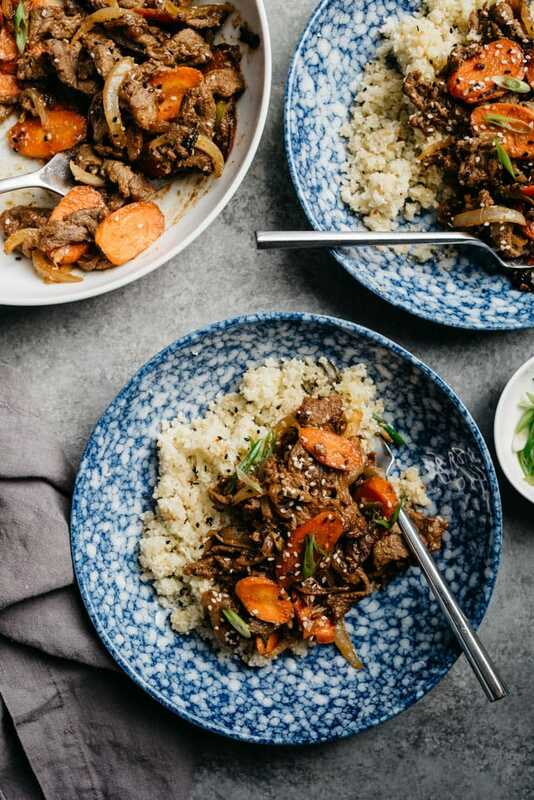 This bulgogi recipe will easily become one of our new Friday night go-to’s, though, so I’ll be trying it soon! I cannot speak to leftovers duration because Cameron and I have zero self-control and ate ours for lunch the day next. I can, however, say that leftovers reheat beautifully, and the flavor might even be better the next day. Bulgogi is a traditional Korean recipe made by marinating paper thin slices of beef in sweet-and-sour marinade. It's then tossed with carrots and onions and stir-fried over high heat until crispy and caramelized. This healthy Whole30 version is an incredibly easy recipe packed with bold authentic taste that's ready in under 30 minutes. Perfect for a stress-free weeknight dinner or fake-out Friday! Place the beef in the freezer for 30 minutes. Remove from the freezer and slice thinly against the grain, 1⁄16 to 1⁄8 inch thick. 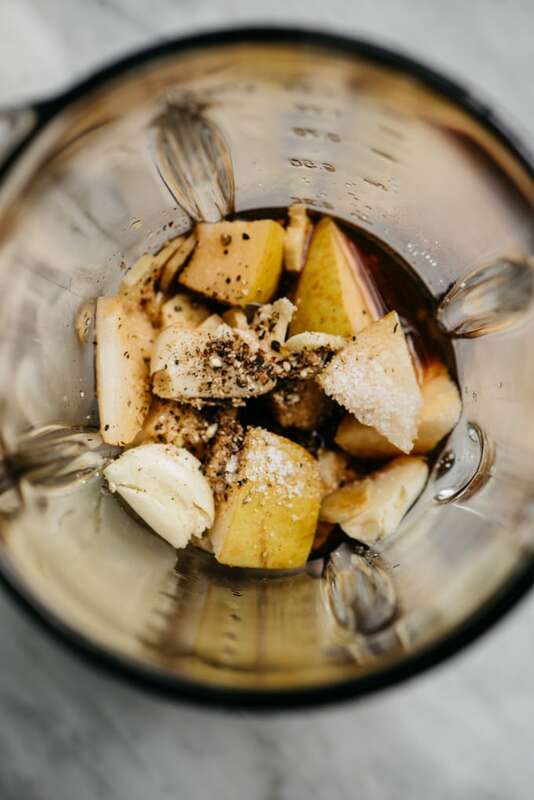 Place the coconut aminos, pear, sesame oil, ginger, garlic, apple cider vinegar, sea salt and black pepper in a blender. Blend well until liquified and smooth. Combine the sliced beef and the marinade in a large bowl. Massage the beef and marinade with your (clean) hands until the beef slices are covered in the marinade. Cover and marinate in the refrigerator for 1 hour, or up to overnight. When you are ready to cook the beef, remove it from the marinade, shaking off the excess drippings. 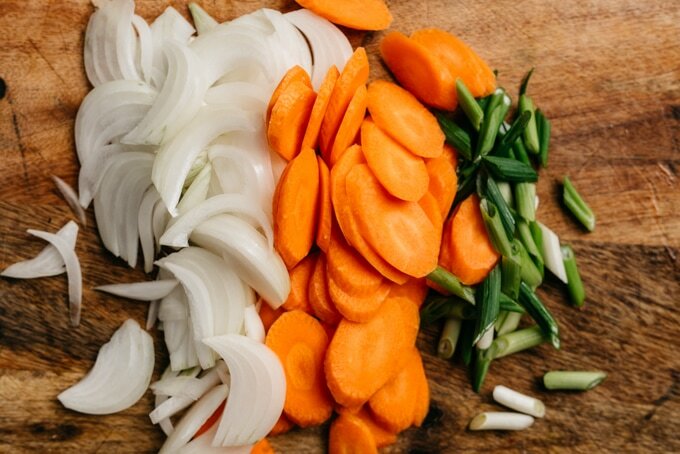 Add the sliced onions, carrots, and green onions to the meat and toss to combine. Heat the olive oil over high heat in a 10" cast iron skillet. Working in batches so you don’t overcrowd the pan, add the beef and vegetables and stir-fry until the meat is browned and cooked through, 5-7 minutes. Transfer the beef to a serving bowl, and sprinkle with toasted sesame seeds before serving. Enjoy on its own, over cauliflower rice, or in lettuce wraps with Ssamjang dipping sauce. This recipe is from the book What Great Grandma Ate by Jean Choi, creator of the blog What Great Grandma Ate. This is one of my FAVORITE Whole30 compliant recipes EVER! Seriously delicious and really simple to make. My husband is a reallyyy picky eater and it’s so hard to cook healthy meals for him – he LOVED this (with a side of steamed cauliflower rice). My 20 month old daughter asked for a third helping! Definitely going to make this many more times – thank you! This turned out great. All the flavors were on point! The meat also stayed tender. This MARINADE! Tastes just like it should!